I could see the bright yellow team jerseys through a filtered tree view. The promise of arrival at our Donner Party Mountain Runners aid station had pulled me through the heat of the early afternoon. I yelled out our motto, “Unafraid!” and zipped around the corner to the most incredible aid station reception imaginable. This feeling of excitement, community and accomplishment sums up my experience at the inaugural Canyons 100k race yesterday. Last year I ran the 50k distance, when the club was in its infancy. One short year later, our club members represented in force, including the ever-exuberant RD Chaz Sheya and both his assistant directors, Pete Broomhall and Chris Perillo. Our club is now a wild teenager and we must have had a least a dozen runners on the course and easily another dozen volunteering. I felt the home-court advantage in a big way. I could not have been more proud of everyone out there and an experience like that makes all the work of the club worth it. I started the race with the smart & funny Jennifer Hemmen. She likes to talk as much as I do. We ran at a perfectly comfortable pace up and down the canyons, chatting the morning away. I can only imagine how annoying that must have been for some around us. 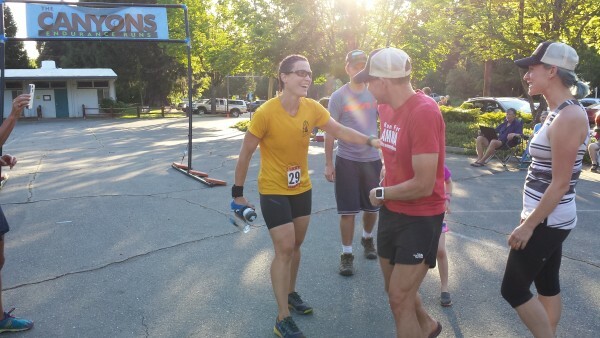 Jennifer is training for her first Western States, but she is no novice. She has paced, volunteered and been involved with the venerable race for years and years. She was a 7-time lottery loser until now. The Canyons 100k is basically out-and-back in two separate directions on the States course. Jennifer’s knowledge of the course terrain and pacing between aid stations was a great help. We arrived at the mid-point in Foresthill in under 7 hours, about 45 minutes ahead of my dismal 50k finishing time last year. I was delighted and took a few extra minutes there to recoup. My coach and co-race director for the Castle Peak 100k Peter Fain (Run on Dirt) was there with my drop bag ready. He was walking on air after just winning the 50k and setting a course record. Last week Peter and I discussed strategy for the day: go relaxed in the Canyons (the first 50k), let loose a little and cruise down to the river, then the race begins with hard work on the way back. I left Foresthill feeling pretty rejuvenated by all the positive energy and started out on the 16-mile section down to the river. I caught up to Jennifer and soon found myself leading a small train of four runners for several miles. In the past this may have pushed my pace, but I didn’t let it and just did my thing, according to plan. The day was really heating up now and it was a very long 8 miles to the club aid station at Cal 2. Jennifer and I submerged ourselves in nearly every creek crossing. I was really amped after leaving our aid station, and then delighted to encounter my bestie and running mentor Betsy Nye running the trail in to work the aid station. She was so excited to see me ahead of schedule and I was already looking forward to seeing her there on the way back. The day became hotter and the creek crossings became fewer. The thing that kept me moving was the promise of fully submerging in the river. I put my tunes on for a while and that was fun, too. The river did not disappoint. It felt as glorious as it did last June when I crossed with my friend Tom while pacing him at Western States. Tom’s sub-24 finish that day provided plenty of inspiration and good memories as well. My body (and especially my quads) were so over-heated that I spent several minutes fully submerged in the river and still did not feel cold. It was highly effective in restoring my core temperature as well as refreshing my legs. I walked up the stone stairs from the river to find Jennifer not looking so great… she was having some bad allergy/breathing issues, but didn’t quite realize it at the time. She sent me on my way up the river. This is where the race begins. Refreshed and refueled, I was ready to work hard. Our Wednesday morning club workouts and my Monday sessions with Coach Peter have helped me (and my body) learn that it’s ok to push harder. I had committed Peter’s pre-race text message to memory, including his signature grammatical mistake: Know that your [sic] in really good shape and don’t be afraid to stay outside your comfort zone. I felt pretty solid for the first couple of miles up from the river. Then I started to realize that my quads were super-trashed. At least this direction is “up” from the river, I mistakenly told myself. While the course from the river is net uphill, there are plenty of short and sometimes steep downhills. Those hurt. I mean, really, really hurt. Luckily, there were also many sections of runnable uphills. For those, I drew on my experiences with Betsy to push myself. My inner dialog went like this: Would Betsy run this? Yes. How far? To that tree. Ok. Go. I was so fired up as I approached our Cal 2 aid station. Our Aid Station Captain-extraordinaire Mike Tebbutt came cruising down the trail toward me. He was pleasantly surprised to see me coming in so soon. He informed me that much of his crew would be leaving once the saw me again. (That was very sweet ~ I felt so loved!) So I apologized to him for coming in so promptly. Betsy and the gang hurried me through and I enjoyed more VIP attention. Betsy lamented that she wouldn’t be at the finish (but she was anyway.) I left Cal 2 for the second time feeling great. I promptly overtook a poor gal having stomach problems. It is a race, after all, and I thought about my husband Javier watching the live tracking from home and seeing me move up to 4th place. We were all wearing GPS tracking devices that were supposed to provide our families with real-time tracking. It didn’t work. It never does at ultras. At this point every little downhill was excruciating, yet I couldn’t just give away the free speed. This is the time in a race where I start to entertain myself by crunching numbers. My dream time would have been sub-14 hours, but I was calculating something in the neighborhood of 14:30, which would still be an hour better than my finish at Bishop High Sierra last year. It would depend on how fast I could do the climbs. I just had in my head that it was miles and miles of steep climbing. But it wasn’t. I guess nothing is really steep compared to the first 50k in the canyons. I pushed myself up the final climbs, not entirely sure of the final distance to the finish. Suddenly I heard Betsy calling my name, but I couldn’t see her. She was at the top where the course leaves the dirt for the final mile or so of pavement. She was so excited for me and hauled to the finish to prepare my welcoming party. I suddenly realized that I’d be coming in under 14 hours! My finish-line reception was so amazing that I almost cried. My own cheering squad into the finish line followed by sweaty hugs all around. I finished 4th woman in 13 hours and 56 minutes. My legs have never hurt so bad during a race and I had never pushed myself as hard. And, yet, it was not my most difficult day racing ~ that distinction goes to my first 100k at the Gold Rush in 100-degree heat. Nor was it the worst I have ever hurt ~ I’m pretty sure that natural childbirth will always hold that record. 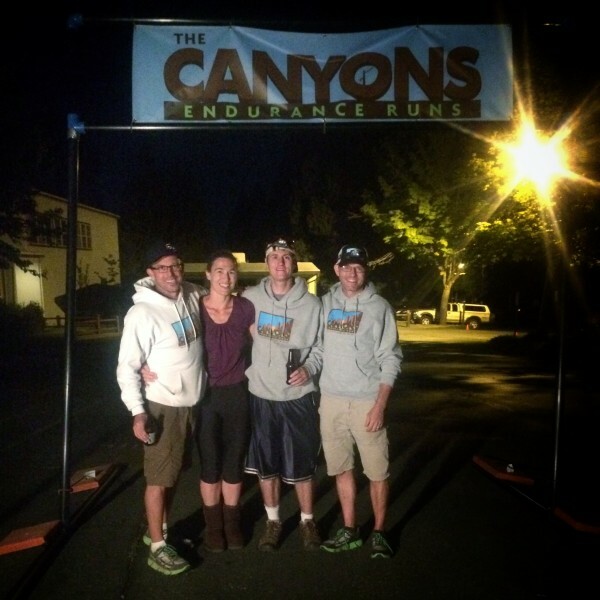 Finally a photo op with the wonderful race directors of the Canyons Endurance Runs. After enjoying a few hours (in my Recovery Pumps!) cheering 100k finishers. It’s truly incredible that you ran twice as far as last year, yet cut so much time off your first 50k (and then ran a near even split it seems?) You worked so hard, ran a very smart race, and the end result was so impressive. You’re the best! Thanks for the note and never-ending support! Yes, it was an even split in terms of distance, but not so much in terms of course elevation, huh? I can feel your exhilaration in your words about the race, about the club and the wonderful support people. It is so fun to read! What an adventure, with such a great support team! I look forward to watching the Castle Peak 100. I just hiked up there yesterday! Thanks for the sweet words, Chica!